World’s First Mother’s Day Gifts Available on Mars — From Uwingu! 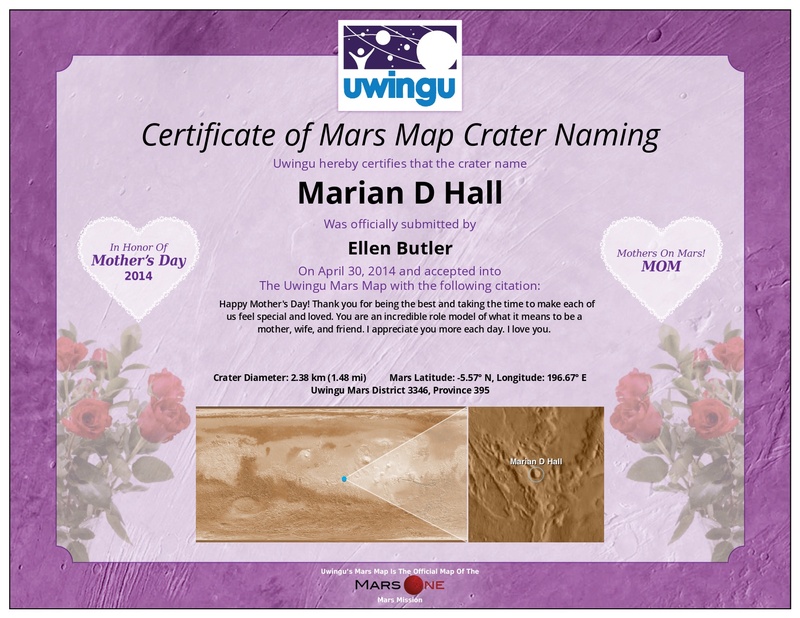 Uwingu, a company helping people personally connect with space exploration and astronomy, today announced a world-wide, first-ever opportunity to honor moms on Mother’s Day from Mars— by naming a feature for her on Uwingu’s new Mars map. Until Mother’s Day, May 11, Uwingu is offering a gift pack which includes a special Mother’s Day certificate for anyone choosing to name a crater for mom. All names will be lodged on permanent record and sent to Mars on the private Mars One mission, ensuring every honored mom a permanent place in history. Uwingu’s Mars Map Crater Naming Project allows anyone to help name the approximately 590,000 unnamed, scientifically cataloged craters on Mars, starting at $5 each. Uwingu aims to raise $10 million for The Uwingu Fund, which provides grants to further space exploration, research and education. Thanks to the sale of almost 10,000 crater names to date, the Uwingu Fund has already funded grants to projects and organizations including the Astronomers Without Borders, Students for the Exploration and Development of Space, Mars One mission, the Galileo Teacher Training Program, Explore Mars and the Allen Telescope Array at SETI. “Our mission is to raise funds for space research while growing a successful company that gets people excited about space exploration and education”, said Alan Stern, planetary scientist, founder, and CEO of Uwingu, who formerly directed all science programs and missions at NASA. Boulder, Colo.-based Uwingu employs of a growing team of scientists, educators, NASA veterans and prominent businesspeople who are passionate about space exploration and education. Yes! Your certificate will be available to print instantly as soon as you complete the transaction. Enjoy! Mine never finshes “creating” and I REALLY need this before mothers day! Please help ASAP!!!!!!!!!! Hello. I’d already made a purchase a couple months ago, which I honored to my mother who died last year. Would my transaction count to receive a certificate? I want to make some mother’s day purchases even at this late date…how do I do it? The link on the website is taking some time to load up. What a wonderful gift for a mother. i support project uwingu foundations very good ?